I would love to have some for my students to use. I am currently teaching a HS forensics class and I really need the fur of different animals for the hair sutdy unit. Help... 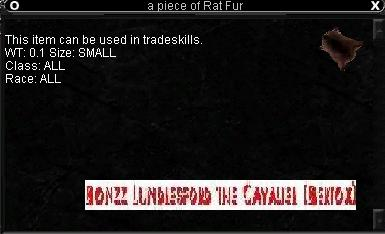 The post says that the Rat Fur is for tradeskills, but does not say what. I am drowning in Pieces of Rat Fur. Anyone know what it is used to make?